43. ‘Canto XLIX’. 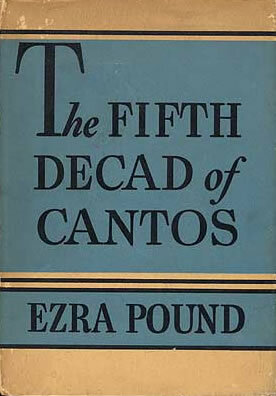 In The Fifth Decad of Cantos. London: Faber & Faber, 1937. The so-called ‘Seven Lakes Canto’, the ‘still centre of The Cantos’, derives from three sources, all related to Japan. The opening 32 lines (57, pp. 244-45) are drawn from a manuscript Pound received from his father, consisting of eight poems in Chinese and Japanese and corresponding sumie of eight famous scenes known in Japanese as Shôshô hakkei, eight scenes depicting the lakes and hills around the river Hsiao-hsiang (Jpn. : Shôshô) in Central China. The Japanese poems are written in the same hand, the Chinese in different calligraphies, though even these, according to Kodama (59), are in a ‘pseudo-Chinese style’ recognisably Japanese. Stylistic evidence suggests the manuscript to be of seventeenth-century origin, or a later copy of a manuscript from that period. On the cover of the manuscript is written in Pound’s hand ‘Source of 7 Lakes Canto’. Kodama was the first to show that the manuscript poems are identical to those published by Sasaki Genryû in Kyoto in 1683 (see 59, pp. 107, 227 n. 88), and Kodama’s account of Pound’s help with the material and his use of it remains the most exacting (see pp. 105-15). For facsimile reproduction of parts of the manuscript, Kodama’s English translation of the poems, and collation of the canto with the manuscript, see Pearlman (121, Appendix B). Following a four-line interlude the canto incorporates two Chinese poems, both among the manuscripts Pound inherited from Fenollosa, which explains the Japanese transliteration of the first (KEI MEN RAN KEI [57, p. 245]), ‘a hymn to the ideal polity under an ideal king’ (59, p. 117). The final adaptation of Chinese verse from Japanese sources (‘Sun up; work’ [57, p. 245]) likewise depicts an ideal society, and bound together in the canto the lines represent a pastoral Confucian ideal set in contrast to the usuries and outrages of spirit depicted in cantos leading to this quiet break. See especially Kodama, Pearlman, Kenner (136), and Palandri (138) for further description and analysis of Pound’s use of the sources, and see also 102 and 148..